Niwa ni manabu koto desu. To garden is to learn. The main gallery at Kokufu. That’s why Ivan Watters, the Chicago Botanic Garden’s curator of bonsai, travels to Japan every year to attend Kokufu — the Japan National Bonsai Exhibition and most important bonsai show in the world. “It’s a true learning experience,” he says. “You pick up technical ideas, artistic ideas, and learn a few bonsai tricks.” For example? “The first branch of an informal upright bonsai should come out of the midline across the front of the trunk. But the unconventional branch on one entry started at the back of the trunk and wrapped around to the side, with a secondary branch positioned to hide the manipulation.” It’s a vivid description, sure to be shared with his bonsai volunteers. 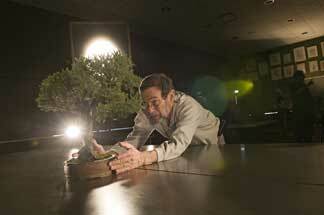 Bonsai curator Ivan Watters arranges a speciment at a photo shoot for Bonsai: A Patient Art. 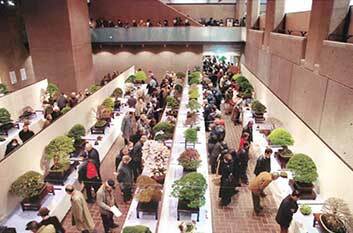 Watters is a long-time member of the Nippon Bonsai Association, the venerable group that sponsors the exhibit. Held this year (for the 87th time) at the recently renovated Tokyo Metropolitan Art Museum, Kokufu brought together 204 of the most outstanding trees in the country, culled from 500 entries. As always, requirements for entry are firm. Trees must reside in Japan (quarantine issues prohibit the Garden from competing) and, if selected, entrants must wait three years to compete again in the show. This year marked Watters’ 20th year attending the show. What caught his eye this year? One large bonsai that combined nine separate Japanese white pines, each more than 100 years old. “It was the majesty of it,” he remarks, “so beautifully placed in their container.” Also large in scale were several bonsai from the Imperial Palace Collection, holding pride of place at the entrance to the show. Displayed on burgundy velvet cloths, the imperial bonsai befit the proportions of the Imperial Palace — many imperial trees are more than 500 years old and have been in the collection for more than 300 years. Watters took a side trip to the Omiya Bonsai Art Museum in Saitama, and to a small exhibit (just eight trees) at a temple celebrating ume season, the flowering of Japan’s plum or apricot trees. 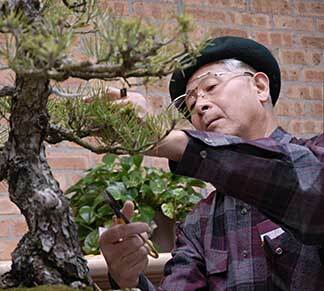 Bonsai master Susumu Nakamura tends a white pine that he donated to the Garden. The trip wasn’t all business. Watters also hosted an 81st birthday party for bonsai master Susumu Nakamura at the latter’s favorite eel restaurant, Izuei. Nakamura, the former vice chairman of Kokufu, donated 19 of his trees to the Garden’s collection in 2000. (Only one other donated tree has come to America, at the United States Botanic Garden.) On this latest trip to Japan, Watters gifted Nakamura with a copy of the Garden’s newest publication, Bonsai: A Patient Art. The beautifully photographed book illuminates the intricacies of bonsai in both art and history. Most of the trees that came from Nakamura are included in its pages, including an extremely fine example of a formal upright bonsai, the white pine shown here, which has been trained for at least 100 years. This spring, Watters and his volunteers are busy repotting more than 100 bonsai trees in preparation for the reopening of the bonsai courtyards on April 29. Watters is also teaching bonsai workshops. Bonsai Basics on June 1 is a good first class to begin your learning. Curious about the Japanese trees at the heart of the Garden’s bonsai collection? Bonsai: A Patient Art is available to purchase. This stunning volume presents more than sixty living masterpieces from the Garden’s collection. Board member and bonsai enthusiast Robert H. Malott supported publication of this beautiful book.